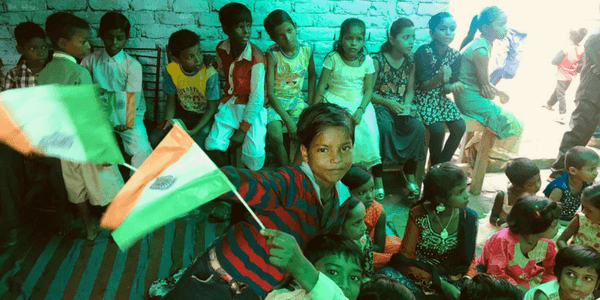 Independence Day Celebration 2018 — Saving Children In Poverty (SCIP) Inc.
15th August 2018 was the 72nd Independence Day for India. The students and teachers at the SCIP ECO school, along with our volunteers, celebrated the spirit of freedom with a lot of gusto, cheer, and food. The whole school and even the streets were decorated in the shades of the tricolor of the Indian National flag -- saffron for courage, white for peace, and green for growth -- each colour signifying something substantial. The students waved plastic flags and cherished the spirit of freedom and patriotism. After the flag hoisting ceremony and singing the Indian National Anthem, one of the teachers gave a speech. It was met with a loud applause and hearty shouts of “Jai Hind!” by the students. Later, our volunteers distributed food and cold drinks -- namely Samosas and Fanta -- among the kids, who really brightened up at the prospect of a savoury snack. We, at Saving Children in Poverty, truly believe in the power of education to transform lives and to unleash freedom. Please help our not for profit charity in its sincere efforts to provide quality and free education to all.